You ask valid questions – and I believe conservatives should be challenged on any and all issues they oppose. Nonetheless, you don’t appear to think like a conservative/libertarian when you use the across-the-board cliché that our oil supplies can be cut off upon some whim. This is pure fancy. Yes, prices may spike due to some event (we assume in the mid-East, but it can come from anywhere) but the USA has varied oil suppliers, the largest being Canada. Indeed, conservative solutions of more domestic and offshore drilling would decrease further the risk of US oil supply becoming to concentrated on one source. Regarding public highways – indeed, a true conservative solution would be local road and peak time pricing. A conservative should argue that the Federal Government building an interstate system has been a huge subsidy to the auto and oil industries. Prior to 1950, when rail and bus connected every city in the country, I would imagine the Feds were hardly involved at all. It was mostly a private rail system, with privately run bus companies. The involvement of the Federal Government has destroyed that pleasant state-of-affairs you referred to. Most important – as a Conservatives/Libertarian I do not oppose mass-transit. Why would I? If Chicago wants to build a bigger subway – let them build it and fund it. Their local voters know what they need, and can manage it best. “carbon friendly” trains, living wages, or a host of other such nonsense – then what may be an economically efficient project quickly becomes a boondoggle. That is a VERY different thing – and should be opposed. William Lind and I have been on opposite sides of the transit debate for the last 20 years. His argument that conservatives ought to support public subsidies for rail transit because conservatives either ride it or can profit from the urban development along the tracks overlooks even more important reasons for why conservatives ought to oppose it. The conservative philosophy of government has never been one that has focused on what goodies government can deliver to conservative constituencies. Tapping into the public treasury in order to dole out loot is the liberal/socialist philosophy of government. Conservatives should rightfully shun opportunities to get aboard the gravy train. Subsidies are the path to bloated government budgets and insolvency. A very cogent reason for why conservatives should oppose subsidizing rail transit is that it is, by far, the most expensive means of urban transportation. When ALL costs are considered (capital as well as operations), on average, the cost per person-mile of travel by bus is twice that of travel by car. The cost per person-mile of travel by train is twice that of travel by bus. Consequently, a city’s decision to implement rail transit is one that will obligate its taxpayers to cover huge and perpetual financial burdens. The notion that rail transit can make a significant dent in traffic congestion or air pollution is pure wishful thinking. At best, we might expect rail transit to account for one to two percent of the travel under normal circumstances in most cities. This small reduction in automobile travel is often offset by congestion caused when rail transit occupies city streets. The City of Phoenix’s environmental impact study, for example, projected that its light rail transit system would actually slightly worsen traffic congestion and air pollution. Publicly owned and operated rail transit is a symptom of the government overrerach that conservatives have opposed since at least the FDR years. True conservatives ought not be seduced by promises of “cool rides.” We have no chance of being taken seriously in our efforts to cut back the tendrils of the nanny state if we can’t hold the line against something as wasteful and ineffective as rail transit. John Semmens worked for the Arizona Department of Transportation for 32 years before retiring in 2008. He has written numerous papers and magazine articles on public transit issues. There is another aspect of transportation that a true conservative should also look at. Granted, it is marginal, in that it has limitations – the fitness of the user, climate, and range – but, within that range, it can out-perform ANY mode of public transit – it is guaranteed door to door, and requires NO additional infrastructure. It is – as you might have guessed – the bicycle. In a range of about five miles, it is every bit as quick as any transit – except, possibly, those operating on private rights of way. It is almost as fast as the private car – and has a far less onerous operating cost. What, then, does it need? Only two things – a) enough people on bikes to ensure that motorists do see bikes and their riders, and b) education of all drivers (motorised and non-motorised) alike) as to how to deal with this thing on the road. The simple fact is that no additional infra-structure is required. Our streets, paved or not, will serve the cyclist as well as any motorist. Parking facilities are far less expensive that for cars – occupying much less possible business space. Further, there are a wide range of spin-off benefits to the rider – health and general fitness being the greatest of these – at NO ADDED COST to the cyclist. In fact, there is a great saving of time and energy here, for the cyclist, in just doing what he must to get to and from work, is spending the equivalent of at least a single session in a Gym – using time that would be spent in transit to and from work. Then there is the benefit to mental health that comes from the exercise. I’ve been employed in a job that can – if one let it bother one, induce a great deal of stress, a Government job, in short. Yet, just the work of getting myself to and from work on a bike has gone far to ensure that I can see the world in a sane, reasonable manner. All annoyances – all the petty fighting of the work-place – can be worked out in a furious ride – which, then, serves to get me where i need to be so much the faster. Granted, it is not for every one – a certain level of strength and a certain amount of competitiveness is required, to make it work. The climate can also work against it – cycling in high heat and humidity – can be done, but it tends to leave one a sweaty mess. Rain – not a question, unless one MUST be point-device in ones clothing at all times. In my experience, one has no choice, you WILL get wet – out-side in, or the other way. Cycling on snow and ice IS possible – now. (How I dreamed of studded bike tires in my youth, to ease that awful gap in the winter when one simply could NOT ride.) but it takes a very determined person to do so. The biggest beauty is the lack of necessary public cost – and the individual level of investment. Actually, I’ve always thought “You broke it, you fix it” was a conservative value, taught to me by my parents. I’d agree with Mr Rath if the Federal Gov’t wasn’t so heavily involved in not only breaking the original setup, but in continuing to subsidize the road systems. It’s that blood-red hand that makes it a federal issue, from my viewpoint. The only really conservative solutions I see to the issue are to drop all road subsidies completely and require they all be self-supporting by user fees such as tolls or gas taxes, or subsidize rails to a similar extent, simply to restore the level playing field the govt took away years back. If passenger rail travel can’t be done profitably with no more subsidies than the auto/oil/hiway industries get, they deserve to disappear, period. As it is, they didn’t die; they were murdered. My comment is in reference to your statement, “We will still use cars to go to the grocery store; no one wants to lug home ten bags of groceries on a streetcar.” There are dozens, perhaps hundreds or even thousands, of us low-income folks in the Denver metro area who rely on two-wheel pull carts and local buses to carry our groceries home. My bus route serves Denver, Lakewood, and bus stops, going and coming, beside the only supermarket near downtown Denver. We cannot purchase cars and our mobility relies solely on this bus line. All buses have lifts that are used not only for wheelchairs, but also for grocery carts and baby strollers. I am fortunate, in that I can walk to two grocery stores, one of which is a Walmart only one mile from my home. I will gladly “lug home … bags of groceries” on the West Corridor Light Rail when it is completed in 2013, one block from my apartment. Regarding bringing home the shopping, there is at least one viable option that doesn’t involve trains or automobiles: cargo bicycles. This is only really practical in a dense urban area, but the utility of a good cargo bike (a Dutch “bakfiets”, a Danish “Nihola”, and others) is hard to pass up once you’ve done some research into the matter. We’ve seen our cargo bike business slowly grow over the past year, and with commodity market instability on the horizon, shopping via a well-built cargo bike is a trend to look for. I read this, and Portland was mentioned, and then I thought of all of the Portland rail stations I know, and virtually all of them are magnets for criminal activity. They eventually bring that activity to every neighborhood they touch. Also, I don’t think rail lines are particularly family friendly or ever will be. I mean, unless true conservatives want their kids surrounded by gang members, meth-heads, whores, homeless people with mental problems and so forth. This article really makes no mention of the valid reasons why many nice suburban conservatives *don’t* take public transit. Car accidents happen, sure, but I suspect a lot of parents who are able to do so would prefer to have their kids watching Disney movies in mini-vans than expose them every day to what goes on on public transit. The “benefit” of Portland-to-Clackamas development, additionally, is highly questionable. A lot of those houses are now sitting empty and the developers are bankrupt or struggling. As with the Obama administration, the extremely liberal Portland city government is obviously going to spin its massive, over-reaching public works projects as unquestionably beneficial to everyone. Currently, they are spending “somewhere between” 613 million and 1.5 billion dollars they don’t have to make the city EVEN MORE bike friendly — it’s currently rated something like #2 in the world. This money will eventually come from law enforcement cuts, and, it is rumored, will be in part borrowed from some of the city’s basic utility funds. If this isn’t crazy liberal overspending, I don’t know what is. Q: Why do conservatives turn into subsidizers when it comes to cars, roads, parking space and oil? A: It’s the only way to prolong the idea that you can always travel between gated communities and corporate car parks without having to rub shoulders with icky colored people and muslims. In reply to John Semmens, I must address a few of your claims. As a libertarian conservative myself, I considered myself strongly aligned with the pro-transit faction of conservatives. 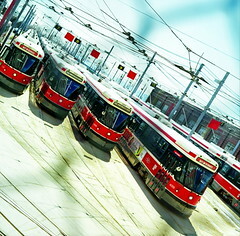 Let’s not kid ourselves– transportation is costly by all modes, but the reason modern conservatives do not support public subsidies for mass transit is simple– the false perception that it is wasteful spending, the preservation of the highway and associated industries, and the affinity with cultural conservative characteristics like low-density land uses and automobile dependence. First, the congestion argument is a huge straw man. Transit advocates who have thought about this realize that mass transit does little to relieve congestion. But it doesn’t mean to. The available transport capacity acts as an alternative, meaning that commuters can choose to commute congestion free or choose not to. But let’s consider other options, like expanding highways. This solution has not helped at all, whatsoever. Induced demand, a common phenomenon observed among transportation engineers, merely brings congestion back to similar or worse vehicle-capacity ratios as before. The only way to significantly reduce congestion is to: 1) reduce road capacity thus reducing overall aggregate vehicle travel times, 2) implement road pricing or tolling, or 3) allow for economic recession or peak oil to reduce demand. As far as your assertion that urban mass transportation is the most expensive, that is partly due to the lopsided subsidies that highways received to begin with. If you factor in highway capital costs, the vehicle purchase price, gasoline, parking fees, insurance, and other driving-related costs, then it is much more expensive to drive. We are not even including subsidies like oil and parking. Urban rail transportation, on the other hand, can move the greatest amount of people for each marginal dollar, and can be the most efficient use of tax-payer dollars if complementary land-use policies follow suit. It all comes down to a simple equation of geometry. If we’ve realized that we can’t get rid of congestion, it tell us one thing. The cities we live in are not meant to support high rates of SOV commuting. Various other countries have yielded billions in economic development from efficient urban mass transit systems. Why can’t America do the same? This is absolutely unequivocally NOT the time to take on large amounts (or small amounts, or ANY) new debt! Period, end of argument! End the deficit, pay off the national debt, then lets talk! Oh, and we are so far behind in maintaining our existing road infrastructure it is already in line for funds when available. A key issue missing from the subsidy discussion is an examination of subsidies per passenger mile traveled. By this most relevant metric, subsidies for inter-city passenger rail are astronomical. I don’t think it is wise to subsidize passenger transportation in any mode but complaining about high subsidies for highway travel while ignoring the stupendously high subsidies for inter-city rail travel is disingenuous or worse. Here is an experiment. Pick a location and distance say Dallas, Texas to Houston, Texas or Saint Louis, Missouri to Kansas City, Missouri or Denver, Colorado. Allow a transportation company like Southwest airlines to develop and manage a rail line for those routes. Provide the same amount of subsidization to the rail system asis provided for the interstate highway system on those same routes and measure costs/mile over a period of time. Then remove the subsidies for both and allow a transportation company to privatize the highway system and again measure the costs/mile to travel and maintain the distance. I truly don’t know which would be more cost efficient. As for Stu’s comments, if you want to pay down the debt, privatize the road systems. Sell them off for their true cost and value. Then allow the operating companies to pay taxes on the revenue generated. Please try to envision cities that people really want to live in. Try to imagine transportation systems that move people conveniently, quickly, pleasantly, and cost-effectilvely. We waste far more time and money getting from here to there in this country than any society in the world, and our cities are the laughing stock of the developed world for their lack of attractive public space and quality of life. What would we do if we really wanted to make things better? Improve the city? Minimize public and private expenditure on transportation? From that perspective, it makes sense to maintain roads and bridges, but everything we do to expand the car system looks like digging the hole deeper. As a fiscal conservative, I’d like to see us spend our household and government money in the most cost-effective way over the long term. Any reasonable accounting of our present system and survey of the many alternatives proven effective in other places shows that we could be spending our money more wisely. Wherever cities are attractive to tourists and a smart workforce, and where the time/money investment in transportation is small, there are two key features: streetcars and cycle tracks. Maybe you’ve never seen what happens to a neighborhood when streetcars and cycle tracks are installed–the shopping, the kids, the new businesses. Maybe you don’t want to read on the way to work, or bike to work instead of going to the gym (and stop for groceries on the way home of course). If you are one of those who simply can’t imagine getting around without your car, streetcars and cycle tracks are the only hope you have of emptying the highway of the rest of us. I’d like to thank Paul Wyerich and William S. Lind for their articles and giving a conservative perspective. And honestly, this is my favorite quote: “So why are conservatives using the public transportation we are told they oppose? Because being stuck in traffic isn’t fun, even if you are driving a BMW. On a commuter train or Light Rail line, you whiz past all those cars going no-where at 50 or 60 miles per hour—reading, working on your laptop, or relaxing, instead of staring at some other guy’s bumper.” That’s what I like about riding transit, I can sit, read, think, do stuff and let someone else worry about the driving. You can do a lot more on transit than driving.